S I G N & D I G I T A L G R A P H I C S • May 2018 • 13 GMG and Global Graphics Software Join Forces on Inkjet Color Germany-based GMG, a developer and supplier of high-end color management software solu- tions, announces a partnership with UK-based Global Graphics Software, makers of software for the digital inkjet printing industry, among other markets. Under the partnership, GMG's technology will be available within Fundamentals, Global Graphics Software's toolkit for building a digital front-end for inkjet presses. Fundamentals is a software and engi- neering services package that helps inkjet press manufacturers get to market quicker. "The combination of Global Graphics DFE technology and GMG OpenColor prediction and profiling technology fulfils the ever-increasing quality and pro- duction demands," says Ian Scott, GMG managing director. Justin Bailey, managing director of Global Graphics Software, says: "We are really excited to be working with the go-to company for high-quality color management in the labels and packaging market." 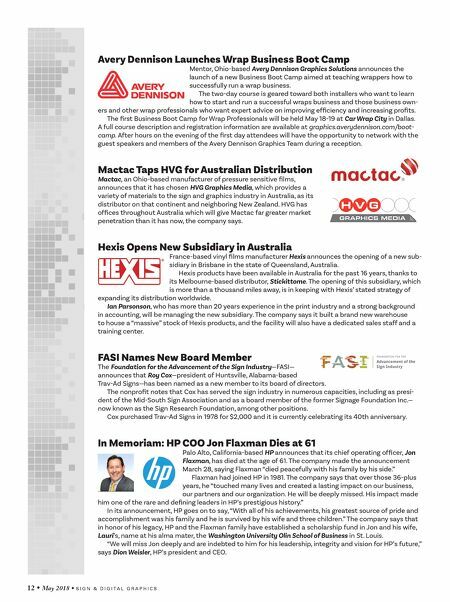 Minuteman Press Acknowledged by Business Press Print shop franchise Minuteman Press International, Farmingdale, New York, announces recent acknowl- edgements from both Entrepreneur magazine and Franchise Business Review. The company says it has been rated the No. 1 printing and marketing franchise by Entrepreneur for the 15 th straight year and for the 26 th time overall, and that it has been named to the Entrepreneur Franchise 500 list. "It is a testament to our Minuteman Press franchise owners who follow our tried and proven system, our corporate staff, our regional franchise support teams, and our franchise business model that we are the No. 1-ranked marketing and printing franchise by Entrepreneur in 2018," says Bob Titus, Minuteman Press president and CEO. Minuteman Press also says it was recently named a top franchise for 2018 by Franchise Business Review. The company says this is the 13 th annual ranking of the top 200 franchise opportunities. Need nancing options? Whether you are buying or selling – we offer fast financing for a fast world. 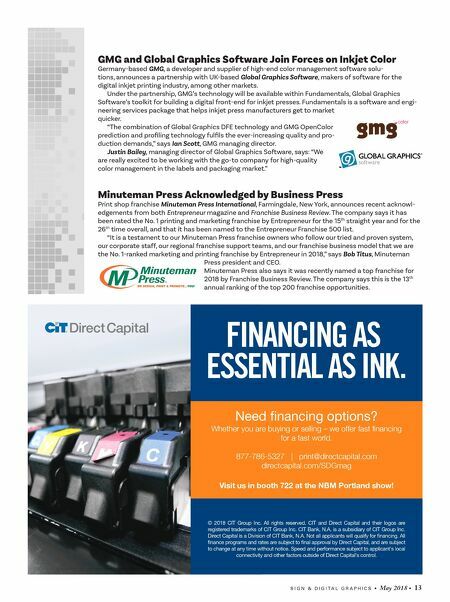 877-786-5327 | print@directcapital.com directcapital.com/SDGmag Visit us in booth 722 at the NBM Portland show! FINANCING AS ESSENTIAL AS INK. © 2018 CIT Group Inc. All rights reserved. CIT and Direct Capital and their logos are registered trademarks of CIT Group Inc. CIT Bank, N.A. is a subsidiary of CIT Group Inc. Direct Capital is a Division of CIT Bank, N.A. Not all applicants will qualify for nancing. All nance programs and rates are subject to nal approval by Direct Capital, and are subject to change at any time without notice. Speed and performance subject to applicant's local connectivity and other factors outside of Direct Capital's control.